For the last two years the centre of Stavanger has been in the throes of rebuilding work for a new look to the inner harbour (or vaagen) and market place (or torget) in front of the cathedral (Domkirken) - but it was finished just in time for yesterday's 17th May national day celebrations - syttende Mai. Last year cruise ship passengers must have been wondering if Stavanger was re-enacting a war, but now, thankfully, it is all over - the drainpipes and cables have been replaced, the archeologists have been and gone, and an enormous expanse of white granite now covers the entire area, from the guest harbour to the cathedral. 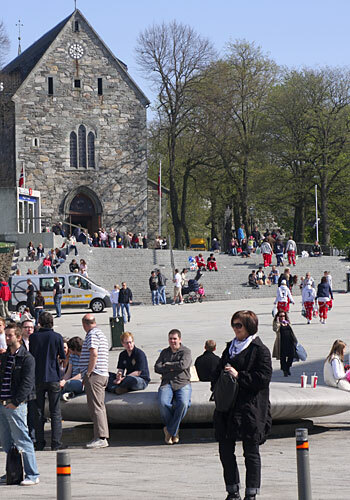 This area is called Stavanger tusenårsplass in Norwegian.